Build up warehouse layout model. Create visual presentation. Share your idea in a fun and efficient manner. Do you have difficulty visualizing a new warehouse? Do you have issues explaining to clients their proposed warehouse layout changes? WarehouseBlueprint has a solution to your problem. Human are accustomed to seeing three dimensional objects. However, most warehouse layouts are in two dimensional CAD drawings. They are both difficult to visualize and explain. With the ability to draw in 3D, you will be able to able to explain with clarity to anyone any area of the warehouse. You will be able to help your client understand the layout of the warehouse. A free step-by-step guide to walk you through the basics of using SketchUp for warehouse design modeling. You will have a good understanding of the functionalities and draw 3D objects using the software. You will also learn to modify existing components. Start mastering the skill with 5 free tutorials. Imagine coming up with a three dimensional pallet rack of various configuration within seconds. 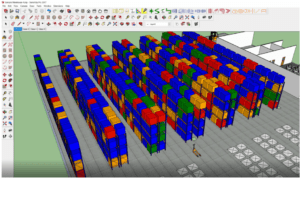 This SketchUp extension allows you to model the entire warehouse within minutes. Yes, even if you are new to the software! There are multiple dynamic components which allow you to make changes to the components instantly to be placed in your warehouse model. Enable you to generate warehouse heatmap for pallet racks in 3 dimension and determine pick path of operators. This plugin extension is useful for operations to visualize the locations of the fast moving items. It also enables the calculation of the time required to pick products from different storage locations.